Update #3: The Chinook boards have been sold. I'm asking $140 for the remaining boards (2 Wave on Wave and 2 Denise's Spirals) or $74 per set of boards. Update #2: Two of the Wave on Wave Boards and the Bubbles boards have been sold. Will sell the remaining 7 boards for $244 or per set of boards at the prices shown. Thanks! Update: The Bubbles boards have been wold. Will sell the remaining for $315. R&S Pattern boards for sale. 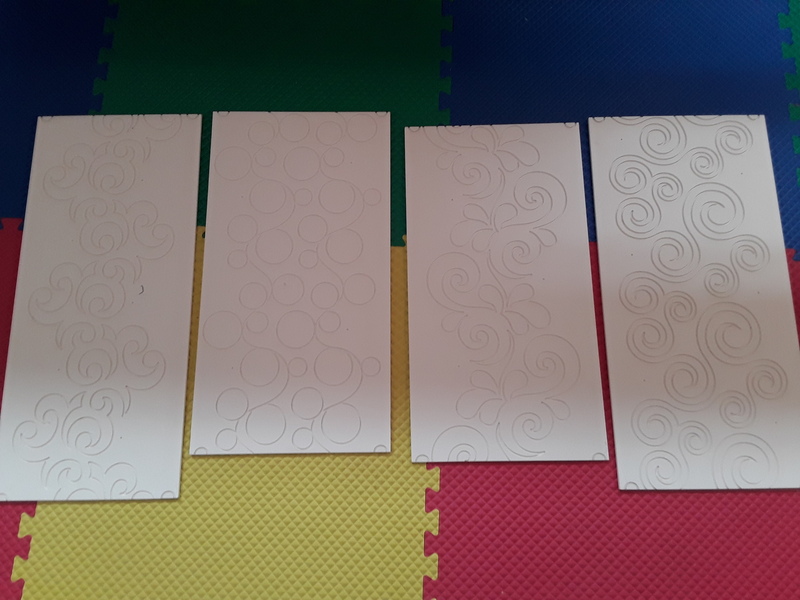 From left to right: Chinook (3 boards), Bubbles (2 boards), Wave on Wave (4 boards), Denise's Spirals (2 boards). Would prefer to sell all together for $385 (includes ground shipping in the Continental U.S.). If sold separately, the cost would be $111 for Chinook, $74 for Bubbles, $148 for Wave on Wave, and $74 for Denise's Spirals. If you would consider selling one of each board I would be interested in what you would ask for them. Bonnie, I don't think I want to break up the sets, but let me give it some thought. Thanks. For the two Bubble boards what are the lengths? I think two boards would still be short. Let me know. Each of the Bubble boards are 22.5". When you reach the end of the first board and go on to the second, you simply pick up the first board and move it to the left of the second one to extend the length. Because of their size, they're very easy to move. Hello! Are the wave on wave boards still available?